In her ‘day job’ Dina works as a Teacher Educator and Trainer at the University of Applied Sciences Northwestern Switzerland (FHNW) in the field of ESOL. She’s been a teacher for over 22 years – or longer if you count the times she played teacher as a child. 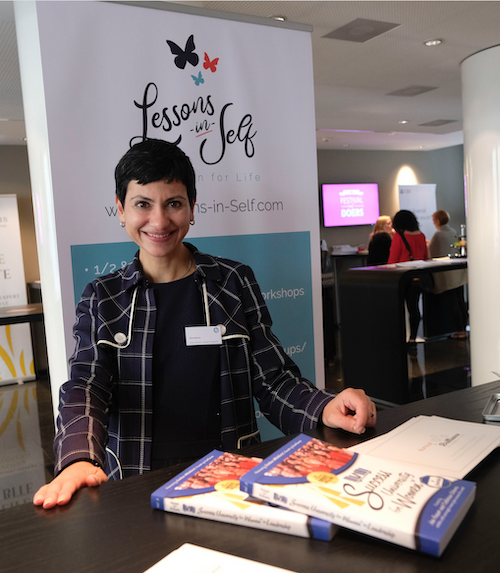 Dina is also founder of Lessons-in-Self, she is at her happiest sharing her life’s journey, by inspiring and empowering others to becoming the person they are destined to be through her transformational Education for Life programmes, which she’s presented at teachers’ conferences in Switzerland and the UK as well as teaching her methodology at schools..
She’s developed programmes that aim to support and develop wellbeing, or a healthy sense of Self which can be used by both teachers and learners alike. Though on first appearance these activities appear unassuming, they have the creative potential to reach a much deeper level. Linguistically, they are so simple they can be used with almost any level and teaching context within an ESOL context too.